With his induction into the Professional Football Hall of Fame, Michael Strahan joins an elite group of players. 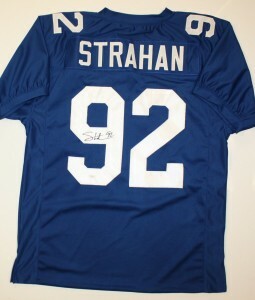 As a result, Michael Strahan cards and autographed memorabilia will, in all likelihood, see a slight increase in demand. 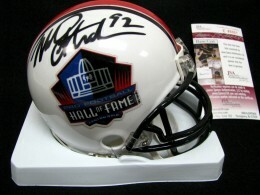 The seven-time Pro Bowl selection and Super Bowl XLII winner, spent his entire 15-year career with the New York Giants. Playing in a large market, being a Super Bowl Champion and maintaining his presence in front of the camera as an analyst and commentator all ensure his popularity and relevancy for years to come. As a very visible personality in New York City, Strahan is a willing in-person signer. He does not participate in many public autograph signings, though. That might change as a result of his enshrinement in Canton. 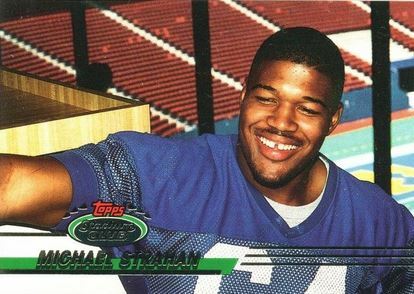 Michael Strahan has a total of ten rookie cards, all of which were released in 1993 products. This error card was corrected in a later printing. Cards without the "Draft Picks" logo can sell in the $100 range. The popular full-bleed photography of the Stadium Club brand was an instant hit with collectors upon its debut a couple of years prior to this release. 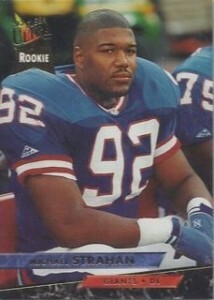 The card showcases Strahan without a helmet, allowing him to show off his signature smile. Also featuring a full-bleed photograph, 1993 Ultra Michael Strahan rookie card enjoys one of the brand's best designs with subtle foil accents. Featuring him with a much different look on his face than the Stadium Club card, this is still one of his most popular rookie cards. 2017 PANINI XR MICHAEL STRAHAN #'D 45 49 BLUE GILDED GREATS. 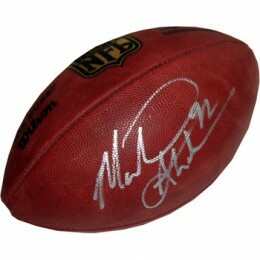 Below you will find an example of what Michael Strahan's authentic signature looks like. This can be used as a first point of reference for determining the legitimacy of autograph memorabilia, but is not a substitute for having your items authenticated by a well-respected professional autograph authentication company. Some of the trusted sources within the sports memorabilia market include the following companies: PSA, JSA, Tristar, and Mounted Memories. Click on any of the images below to view full size photos. 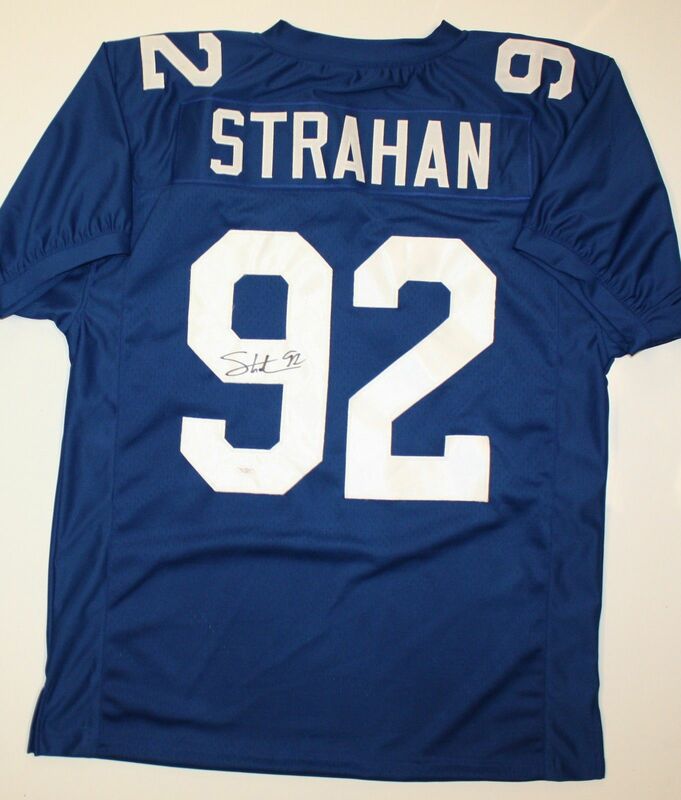 Michael Strahan Key Signature Attributes: An authentic Michael Strahan signature autograph will exhibit several distinguishing characteristics. However, depending on the type of item signed or in what setting, his signature characteristics can change. The entire signature is very illegible. The most discernible letter is the "M" which he doesn't always sign; it begins with a slightly angled up stroke before a rapid series of up and down lines. The "S" is is very hard to discern but it sits in the middle of the signature. The "t" is crossed and extends into the "h" which is represented with just an up and down stroke. The remaining letters of "a-n" are not present. He almost always inscribes his jersey number "92."